You are here: Home > SWEET CRAVINGS! Choose from Jumbo Waffle Bath Bombs, Sweet filled Donut Bath Bombs, or Ice Cream Sandwich Cookie Bath Bombs or Ice Cream Cone Bath Bombs! Each product is made from scratch. 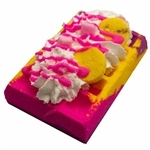 We hope you will enjoy these novelty, fun and pampering bath bombs! "Sweet & hearty" looks good enough to eat concoction! Everything's bigger in Texas!! And our peaches are ginormous! !